Background: Here are five chapters from the last of three anti-Semitic childrenâ€™s books published by Julius Streicherâ€™s Stürmer Publishing House. The author was Ernst Hiemer, Streicherâ€™s second-in-command. Each chapter compares Jews to unpleasant forms of animal life: drones, hyenas, chameleons, coo-coos, locusts, bedbugs, starlings, mongrel dogs, poisonous snakes, tapeworms, and bacteria. The title comes from one of the stories, which focuses on a mongrel dog. Three of the stories end with calls to kill the Jews. And remember, this book was intended for small children. The book was viewed as crude even by some Nazis. For example, Der Hoheitsträger, a monthly for party leaders, gave it a brief negative review. For more information, see my book on Julius Streicher. 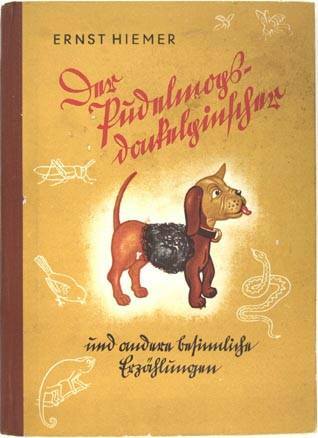 The source: Ernst Hiemer, Der Pudelmopsdackelpinscher (Nuremberg: Der Stürmer-Buchverlag, 1940). Evening is coming. The sun slowly sinks in the west. The farmyard grows quiet. Only the bees are still at work. They fly from flower to flower and gather sweet honey and golden pollen. Api, a little worker bee, returns. She quickly flies into the hive. She fills the honeycombs with all the honey that she has gathered with her hard work. Her comrade Melli is next to her. She is usually a happy little creature and laughs the whole day. But now she is in a bad mood. Angrily, her big eyes look to the honeycombs in the upper corner. Many bees who are much bigger and fatter than Api and Melli have gathered there. And these bees do not work. They can do only one thing: eat, eat, and eat! Little Api has been listening intently to her friend. Fourteen days have gone by. Api and Melli have educated the bees. At first the bees did not believe them. And when the drones learned that the truth about them was out, they roused the other bees against Api and Melli. But the two were not intimidated. Wherever they went, they spoke about the danger of the drones. Soon ten other bees believed them and hated the drones. Then it was a hundred  then five hundred!  then a thousand and even more. But the bees could no longer be fooled. At Melliâ€™s command and under the leadership of Api, they attacked the drones. The battle was terrible. The drones were defeated. They were killed or driven out. Not one of them remained in the beehive. There are drones not only among the bees, but also among people. They are the Jews! Every nation has millions of workers, farmers, officials and so on. They work hard, like the bees. The worker goes to the factory every day. The work is hard. But he does it gladly. He knows that his labor is necessary if his people are to live. The farmer works his whole life to grow what the nation needs  their daily bread! They are all “worker bees!” They work for the whole people. The farmer could not live without the worker, or the worker without the farmer. Without shoemakers, neither workers nor farmers would have shoes. If there were no teachers and inventors, who would discover things and build machines? Everyone depends on everyone else, regardless of whether they work with their minds or their hands. But there are also “drones” who live among the peoples of the earth. Who are these drones? They are the Jews! What does the Jew mean by that? He means that he hates work because it is hard and difficult. What does this mean? It means that the Jews think only Gentiles must work. The Jew thinks that the Gentiles must work for him. He himself does not have to do anything. The Jews do not want to work. They only want to live from the labor of others. They are just like the drones in the beehive. They are lazy. They do nothing. They create nothing. They rob the community. They exploit the people. These Jewish drones appear in various forms. For example, there is the Jewish tramp. A tramp is a person who never works. But he understands how to exploit those who do work, and knows how to live an easy life through the work of others. Then there is the Jewish fence. He buys goods that thieves have stolen. He earns a lot of money. But he creates nothing. He only swindles other people. He is harmful to the nation. Then there is the Jewish farm swindler.He has no land, he does not sow, he does not tend a field. But through sneaky swindles he takes over many farms and throws whole families into misery. And there is the Jewish merchant. He buys shoddy goods and sells them at enormous profit. The worker who has labored the whole week gives his money to the Jew in exchange for trash. He is the drone of humanity. He is the exploiter of the labor of others. He is an enormous danger for all the nations. If one overlooks this danger, whole peoples can be destroyed. History is rich in examples that prove to us that the Jew has ruined millions of people. But many do not know that the Jew is the drone among people. They see the Jew as an innocent and entirely harmless fellow citizen. They do not know that the Jewish danger for our people and for the whole world is the same as the danger of the drones to the bees. They do not know that the Jewish Question is the most important question in the world. The bees recognized the danger of the drones. Therefore they fought the bloodsuckers. Ruthlessly they cleansed their people of drones. Only then was there peace and order. How is it with people? Until they have cleaned out the Jewish brood of drones, there will be no peace and no prosperity among the peoples. Behind a lovely farmhouse in the Black Forest! Two young girls lay in hammocks and swing back and forth. Inge falls silent and breathes in the tangy air that blows from the mysterious forest. Suddenly she sits up. Inge knows that her friend Else always tells the truth. She shudders a little. But she has another question. But Else says “Shh” and points to the snake. The girls are quiet and hold their breath. A little mouse is near the snake, sniffing for food. When the snake notices the mouse, it is suddenly transformed. It raises its head in the air. The eyes, formerly so dull, become bright. The snakeâ€™s body tenses. The adderâ€™s tongue flits quickly in its half-open mouth. Suddenly its body quivers. With amazing speed the head darts forward. The jaw opens and the teeth sink into the body of the little mouse. The poison enters the blood of the startled animal. A few seconds later the mouse lies dead on the ground. The adder opens its mouth and swallows its victim whole. Then it glides slowly and wearily back and disappears into the bushes. The girls watch for a long time. Then they leap from their hammocks and run as fast as they can into the farm house. “What is the matter with you?”, Elseâ€™s father asks the two children. Excitedly they tell him the story. The farmer says nothing and listens quietly as the children get the story out. Then he reaches for his pipe and lights it. “Yes, the poor little mouse died right away,” the two children say. There are poisonous snakes not only among the animals, but also among people. They are the Jews. As long as the poisonous snakes do not sense a victim, they behave like the most peaceful and harmless animals. Only when a victim nears do they show their true face. They attack from behind and kill their prey without pity. But one day, the Jew lets the mask fall and shows what he really is, a poisonous snake among people. The same livestock Jew who formerly seemed so nice and friendly suddenly and pitilessly robs the farmer of everything he has and throws him and his family on the street. The same money-lending Jew, who formerly lent money with the most friendly smile, drives the Gentile merchant into misery and takes over his business. The same Jewish attorney who formerly claimed to fight only for truth and justice robs his wards of everything they have. The same Jewish politician who promised the voters a golden future plunges the whole people into terrible misfortune. That is the Jew! He always proves a poisonous snake amidst the people! There are various kinds of poisonous snakes. There are poisonous snakes in the most varied countries in the world. The same is true of the Jews. There are little and big ones, fat and thin ones, black-haired and even blond ones. There are rich and poor Jews. There are Jewish peddlers, businessmen, merchants, doctors, attorneys, scholars, politicians and stock exchange barons. There are Jews in Germany, England and Italy, in Europe, Africa, Asia, Australia and America. But even if they look much different, if they hide in various occupations and speak the various languages of the world, they are and remain Jews. They are and remain the poisonous snakes of humanity. Just as the snakeâ€™s bite poisons the blood of its victims, the Jews poison the blood of their host peoples. People who let the Jews in lose the purity of their blood. At first they hardly notice as the Jewish poison infects their bodies and souls. But slowly they decline. Their children are half-breeds who bear the physical and spiritual characteristics of the Jewish race. These Jewish half-breeds further poison their peopleâ€™s blood. Once the majority of the people carry the Jewish poison, there is no saving them any longer. The poison has its effect! The people must decline. 20,000 people die each year in India alone because of snake bites. The effect of Jewish blood poisoning is even more terrible. There is hardly a people on early in which the Jew has not caused blood poisoning a thousand fold. There are hundreds of thousands of Jewish half-breeds in nearly every country. Altogether, there are millions of people who have poisoned Jewish blood. The effects of this poisoning of humanity are incalculable. The effects of the poison spread by Jewish newspaper and radio agitators are also frightful. They lie to high heaven and set the best of a people against each other. They bring discord and unrest to people. They poison public opinion. The results are war and revolution. Millions perish. But the Jewish poisoners of nations are delighted at the success of their destructive work. In captivity, poisonous snakes can behave for months as if they are tame. Suddenly, they show their true nature and bite the person who has cared for them so well and so long. It is the same with the Jews. If the Jews are in trouble or danger, if their host peoples are stronger than they, they behave as if they are transformed. They suddenly become shy and quiet, kind and friendly, and creep about on their bellies. They play the “good guy” who wishes the best! They play the humanitarian who always has an open heart for the poor! They pretend to be so dumb as to hardly be able to count to three! Gentile peoples are too easily deceived by this Jewish play-acting. They take the “poor” Jews in and protect and care for them. The Jews are waiting for this moment. Suddenly they show their true face and become completely insolent and arrogant. Woe to the people that are bitten by the “poisoned fang” of the Jews. In most cases, there is no saving them. Medical science has discovered drugs that can combat the effects of a snake bite if they are taken in time. There is also a splendid means of combating the Jewish poison. It is educating humanity about the Jewish world enemy. Every man, every woman, every child must learn the truth about the Jews. Each people, wherever it lives on the earth, must understand the Jewish question. Poor and rich, old and young, all most learn. Only he who knows the poisonous Jewish snake and the results of its bite can protect himself against disease and decline. But education alone cannot solve the Jewish question. A people that recognizes the Jews must also have the strength to deal pitilessly with the world enemy. Just as the danger of poisonous snakes is eliminated only when one has completely eradicated poisonous snakes, the Jewish question will only be solved when Jewry is destroyed. Humanity must know that in the case of the Jewish question there can only be a hard “either/or.” If we do not kill the Jewish poisonous serpent, it will kill us! Mrs. Muller has taken her boy to the doctor. Then he turns to the boy. The examination only takes a few minutes. “Is it serious, doctor?,” Mrs. Müller asks, and looks at him fearfully. Mrs. Müller has become pale. Frau Müller gives a sign of relief. Mrs. Müller is still not satisfied. Mrs. Müller covers her mouth in astonishment. “Thatâ€™s how it is,” the doctor laughs, and nods his head in satisfaction. Now Hans, who up to now hasn’t said anything, speaks up. The appointment is over. The doctor accompanies Mrs, Müller and her son to the door. As Hans is already on the stairs, the doctor calls out to Mrs. Müller. Tapeworms do not only appear in the form of animals. They also appear in the form of people. They are the Jews! Just as tapeworms creep unnoticed into the bodies of humans, so the Jew creeps unnoticed into Gentile peoples. The Jew keeps secret how many of his racial comrades have come along with him. Thus a people has no real idea of how Jewdified the country has already become. Much as Jewry sneaks in unseen, so the innocent host people is gradually led into ruin. Just as the tapeworm does great damage to the human body from within, so Jewry works to ruin the people of its host country. The tapeworm is dangerous because it robs people of the nutrients they need to live. While the person grows weaker day by day, the foreign worm grows more and more, finally reaching a huge size. The Jew plays a similar role in the peoples he has entered. He is a freeloader, a parasite. Just as a tapeworm robs people of valuable nutrients, the Jew robs his host people of the best that they have. Farmers, the foundation of a healthy people, are sucked dry and destroyed by Jewish livestock traders. The Jew seizes a peopleâ€™s commerce and industry. A peopleâ€™s morality is undermined and its youth systematically corrupted. The people gradually sickens. The Jew takes its whole wealth and life force. If a people does not succeed in getting rid of the Jewish tapeworm in good time, it will be ruined. People who have a tapeworm are terribly hungry. A people that is victim to the Jew is also afflicted by a “gnawing hunger” that exhibits itself in revolutions and rebellions. Peoples do not know the Jewish tapeworm that is responsible for their troubles. Since they do now know it, the Jew is the only only one that benefits from the revolutions. Everything the people consumes in its hunger is devoured by the insatiable Jewish tapeworm. Many people do not find the resolve to seek a doctorâ€™s aid in ridding themselves of a tapeworm. The same is true of peoples who fall victim to the Jewish tapeworm. Each day, they sense the unwholesome effect of the foreign guest! They probably feel that their strength is steadily declining! They probably sense their terrible fate. But they never find the strength to put an end to the insatiable Jew. And thus, what must happen happens: The Jew ruins them. The doctor advised Mrs. Müller to end her sonâ€™s treatment only when she saw the tapewormâ€™s head. It means nothing if segments of the worm are shed, for they can grow back. It takes a radical cure, continued until the worm is entirely dead. Just as the tapeworm requires a radical cure, so, too, does the Jew. World history proves that, over the millennia, Gentile peoples have resisted Jewish parasites. Millions of Jewish crooks where chased away by exploited peoples. Hundreds of thousands of those miserable criminals were hung on the gallows or burned alive. This is how these peoples hoped finally to free themselves from the Jewish tapeworm. But they were wrong! The Jews came back in even larger numbers. Just as a person can be cured of a tapeworm only when it is completely destroyed, so the peoples can be freed of the Jewish plague only when they make full work of it. It is not enough to render harmless only a part of Jewry, since the Jewish tapeworm always grows back! Then it is more dangerous than before! All the work was in vain! Tapeworms and the Jew are parasites of the worst kind. If we want to free ourselves of them, if we want to be healthy and strong again, there is only one cure: their extermination (Ausrottung). “You’re right about that, doctor! But now I’m done with it, thank God!” Hans wants to thank the doctor, but doesn’t get a chance to speak. Hans smiles. Then he looks around the doctorâ€™s office. On one table, there is a series of long, thin glass tubes. There is a peculiar liquid in these glass tubes that Hans has never seen before. The doctor notices his guestâ€™s curiosity. The doctor is pleased at his patientâ€™s curiosity. The doctor, who has been smiling so far, turns serious. Hans looks at the doctor in astonishment. “How could these tiny creatures, only a thousandth of a millimeter in size, be a danger to us?,” he asks in disbelief. Hans has no idea. He cannot answer the question, and only shrugs his shoulders. Hans has understood so far. The doctor solemnly points to the test tubes. “Diphtheria is a treacherous sickness,” Hans says. Bacteria, however, appear not only in the form of the tiniest of living creatures, but also in human form. They are the Jews! Just as it is often hard to perceive bacteria, so, too, it is often impossible to recognize the Jew. Not every Jew has the same racial characteristics! Not every Jew has a crooked nose or protruding ears! Not every Jew has a protruding lower lip or black, curly hair! Not every Jew has the typical Jewish eyes and flat feet! No! It is often hared to recognize a Jew. One must look very carefully to avoid being fooled. The variety in the Jewâ€™s appearance is a great danger for other peoples. A person with an infectious disease can easily spread the bacteria to others living nearby. What is true for bacteria is also true of the Jews! A people whose land is next to a country that has been infected by the Jews can easily fall victim to the Jewish bacterium itself. An example! Germany had Poland as a neighbor to its east. At that time, millions of Jews lived in Poland. The Jewish bacterium moved over to us and spread Jewish disease in our country. This disease would have ruined us if Adolf Hitler had not saved us at the last minute. Just as bacteria multiply enormously, so also does the Jewry once it has entered a people. An example! A few thousand years ago, the Jews migrated to Palestine from the east. In that rich land, the Jewish bacterium multiplied enormously. Soon they had taken possession of all of Palestine, and either destroyed or driven away the peoples that had once inhabited this prosperous land. Bacteria bring death and destruction to a person by poisoning his blood. Just like the bacterium, the Jews bring plague and decline to the peoples they infect. They do this by race mixing and infecting Gentile peoples with Jewish thinking. They maintain, for example, that all humans are equal. But that is not true. It is a terrible lie! Nothing is sacred to the Jew. He holds the laws of other peoples in no honor. He knows nothing of loyalty and decency. He knows nothing of love or friendship. He only knows one thing: money, and more money! He will use any method he can find to make money. And when a Gentile people is infected by such thinking, the Jewish bacterium sinks deeper into a peopleâ€™s soul. The whole people becomes sick, and finally is ruined. Doctors have already discovered many good ways to combat the harmful effects of bacteria. But we have not yet been able to exterminate (auszurotten) bacteria. It is much the same with the Jew, Many peoples have taken effective measures against the Jewish bacterium. They have passed laws against the Jew! They have driven the Jew from the center of public life! They have forced the Jew to live in special areas (ghettos)! But no people has yet succeeded in fully getting rid of the Jew. The enemy is always still there! Even when a people is itself free of the Jews, there is no guarantee that it will remain so in the future! The Jewish bacterium is loose in many other countries in the world! There is always a danger of falling victim once more to the Jewish plague! As long as there are diphtheria bacteria, there will be diphtheria! And as long as there are Jews living in the world, there will be a Jewish danger. Eleven stories in this book have told us about the impact of familiar and unfamiliar creatures in this world. Some of the stories were funny, and gave us something to laugh about. We learned how a pair of starlings drove insolent sparrows from their nest. We learned about the unusual experience of Hitler Youth lad Klaus in a “bed bug hotel.” We learned about an unusual animal that can change its color and the shape of its body. We learned about a poodle-pug-dachshund-pinscher that caused an uproar in a whole city neighborhood. Those were the amusing stories. Other stories, however, were more serious, and gave reason to think. We learned about the battle between bees and drones. We learned about the tragic fate of a pair of grasshoppers, about the insatiable bloodthirstiness of hyenas, about a terrible plague of locusts, about the treachery of a poisonous serpent, of the hidden effects of a tapeworm, and about the terrible danger we face from bacteria. At the end of each story, we made comparisons between the animal and human worlds. And we learned that Jews pose the same danger to humanity as drones to bees, the same danger that the coo-coo is to the grasshopper, the sparrow to the starling, and so on. Later, we learned about the Jewish brood of poison vipers, of Jewish parasitism, and finally, about the Jewish world plague. We learned to see the Jew the way he really is, how he lives. Adolf Hitler broke the power of Jewry in Germany. The Führerâ€™s deed obligates us to keep wide awake, to always educate people. It is not true that the Jew has already been defeated! It is not true that our people is safe from the Jew for all time! It is not true that the Jewish danger is finally past! We today who are building a new Germany and a new Europe under Adolf Hitlerâ€™s leadership will not carry out the final and decisive reckoning with Jewry! No! The final and decisive reckoning with Jewry is reserved for our children and their children. That is why we write this book for you, boys and girls of the German people! You are called to finish the work that the Führer has begun. You must never forget those men who fought All-Judah at a time when it still was in power. These were the men who laughed as they went into prison, but continued their fight against the Jew. These were the men who had to sacrifice their own honor to preserve the honor of their people. A German youth that draws its strength from these models, and fights the Jews with the same determination, must and will destroy forever the Jewish threat. The battle against the Jews is not only a matter for the German people. The Jewish threat is a world threat. The whole world must join in the battle against the world enemy. What good will it do humanity if a single people and its allies defeat the Jew, while the rest of the world continues to suffer Jewish slavery! What good does it do humanity if one people renders the Jewish parasite harmless, but it continues doing its terrible work in other countries and other parts of the world! What good does it do humanity of one people wins the battle against evil, while the rest of the world continues to be enslaved by the Jews! Every four years, this cry goes out to the whole world. Thousands of young men and women come together for the greatest sports festival of the peoples, the Olympic Games. In peaceful competition, they show how they have strengthened their bodies over years of effort. The work and exercise unites the youth of the entire world. Youth knows that the peoples can only be great, healthy, and strong when they strengthen their bodies and their spirits through gymnastics and sports. As long as the Jewish world plague infects the peoples, youthâ€™s strivings will be in vain. From the beginning, the Jew was the incarnation of filth and ugliness, of depravity and decay. Jewry is determined to frustrate Gentile humanityâ€™s strivings for beauty, nobility, and elevated values. It wants to drag humanity into the swamp. As long as the Jewish world enemy is at work, the world cannot rest. Therefore, we call the youth of the world! We call it to a battle for the freedom of humanity. The end of the Jewish parasite of the peoples will forever free the world from “drones,” “locusts,” “bed bugs,” “hyenas,” “poisonous serpents,” “bacteria,” and the “poodle-pug-dachsund-pinscher” in human form!